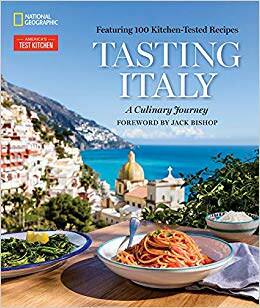 Tasting Italy: A Culinary Journey by America’s Test Kitchen, Eugenia Bone and Julia Della Croce is a cookbook which has recipes from certain regions of Italy. This is a book by America’s Test Kitchen, as informative and educational as the show. The first thing I thought when I leafed through Tasting Italy: A Culinary Journey by America’s Test Kitchen, Eugenia Bone and Julia Della Croce is that this is one heck of a gorgeous book. The book covers Italy by region, with a few words about the culinary culture of that region, it’s history and then… the recipes, all accompanied by first rate photographs. I cooked three recipes from this book – the Chocolate-Hazelnut Cake, the Hunter’s-Style Chicken, and made Fresh Semolina Pasta from scratch. 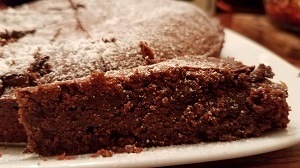 The Chocolate-Hazelnut Cake: from Piedmont region known for it’s chocolates, I had to make this. The recipe was easy to follow and I assume the cake came out good, I was expecting more of a Nutella taste, but it wasn’t sweet. The Hunter’s-Style Chicken: This was a longer bake, not too difficult though. Even though this recipe is from in a book about Italian cooking, but I don’t believe it’s native specifically to Italy. I happen to know this because I’ve made versions of this recipe before, and they were all delicious. That being said, now I understand why this type of recipe works and know enough to add/remove/replace items in it. 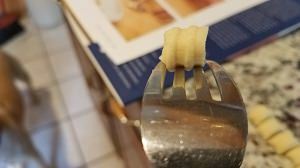 The Fresh Semolina Pasta : I had some time on my hand, creating this pasta was not difficult and I got the hang of it after 2-3 pieces. It does take a long time to roll all the dough into malloreddus, but the kids were nice to “volunteer” to help (frankly they had a great time, even though I don’t know if they’ll be up for it again. From a home cook perspective, the real strength of the book is the “why”, not just the “how”. Each recipe comes with a short, half-page or so, explanation of why the recipe works, why the America’s Test Kitchen staff made the decisions and changes and how one cane make it their own. 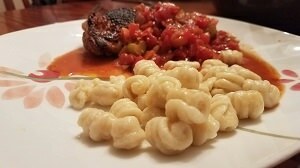 I picked three easy recipes with ingredients we have at our home, or could be quickly obtained, but the recipes vary in ingredients and difficulty. I’m looking forward to cook something which will stretch my limits for the next recipe – when I have time of course. The Hunter’s Chicken and pasta have already got themselves a place in our kitchen’s rotation.